The Sierras are different from the rest of the PCT because you are at the mercy of the passes and they dictate everything. There is a strategy that has to be followed to get over at certain times of the day, or you may put yourself in exhausting and/or dangerous situations. The day before a pass, you want to set yourself up as close to it as possible so that you can get up early and get over them while the snow is still hard. We use microspikes and can move much faster on hard snow. Depending on the temperatures, the snow thaws late morning to mid afternoon and then you’re screwed cause you break through the frozen top layer and posthole deep into the snow, sometimes up to your waist. That makes for exhausting hiking. This year, the temps are warm and the snow is high, so we are in snow basically all day, and the window to use the microspikes is quite slim. After doing Mt. Whitney, the next major pass is Forester Pass, the highest point on the PCT, at 13,200ft. This pass is serious and needs to be done in the morning. Today, the task was to set ourselves up for Forester tomorrow. That means we only needed to hike 9mi today. Seems simple, right? This year, those nine miles are made much more difficult with all the snow that wouldn’t normally be there. In other years, with less snow, hikers have the option of doing Whitney and also setting up for Forester in the same day. Few hikers are able to pull that off this year and we chose to play it safe and split it into two days. Good thing we did! On a normal day, we can usually do 9mi in about three hours. Today, it took five very tiring hours. Here’s the pattern of today. Keep in mind that in all of this, we are in slushy slippery snow or it is in patchy mounds where we have to use a lot of energy to get up over what would normally be a level trail. So the pattern of today was, go uphill, cross a beautiful open valley with 360 degree views, go back downhill, and ford and ice cold creek. Now repeat that three times and that’s what we did very slowly today. Whew! We had a lot of other hikers leapfrogging with us today. We all converged at the first ford of the morning and pretty much stuck together all day. There was Skinny D, Liz, Meow Meow, Funyon, Garby, Pine(who decided not to do Mt. Whitney), Headbanger, Happy Whale, and Speedbump. Here is a picture of everyone trying to warm up and dry off after our first major ford, Wright Creek. That one was so strong that we went across in groups of three or four and linked arms facing each other in a circle. It was a good method and worked. 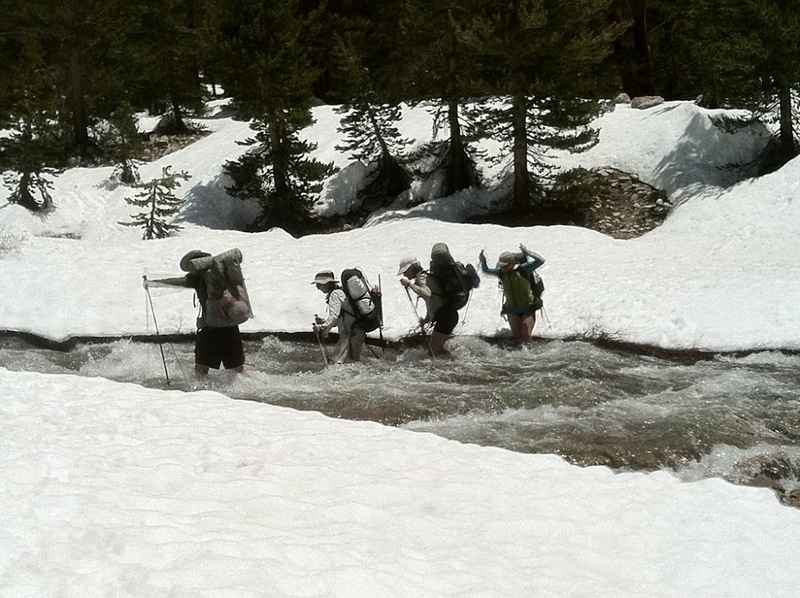 Here is a picture of Funyon, Meow Meow, Skinny D, and Liz crossing at Tyndall Creek. That one was really strong, but we were able to do it individually. So with our short, but long day, we are now 5mi from Forester Pass and that is the closest we can get. All of us are near Tyndall Creek on a forested hill with rocks, boulders, and large patches of snow. We had to each hike up and find a patch of ground big enough for our tents so we are all spread out. We made a game plan for tomorrow and decided to start hiking toward Forester at 3:30am with Speedbump, Headbanger, Happy Whale, and Pine. This will give us a lot more time to move fast on hardened snow and will set us up better for a shorter day into town the next day. We are all anxious to experience Forester Pass because it gets a lot of hype for how challenging it is. Our hope is that it won’t be as harrowing as our Mt. Whitney experience. Hello! This snow year, 2017, has seen record breaking levels of snow in the Sierra. My fiancé and I are attempting the PCT this year. 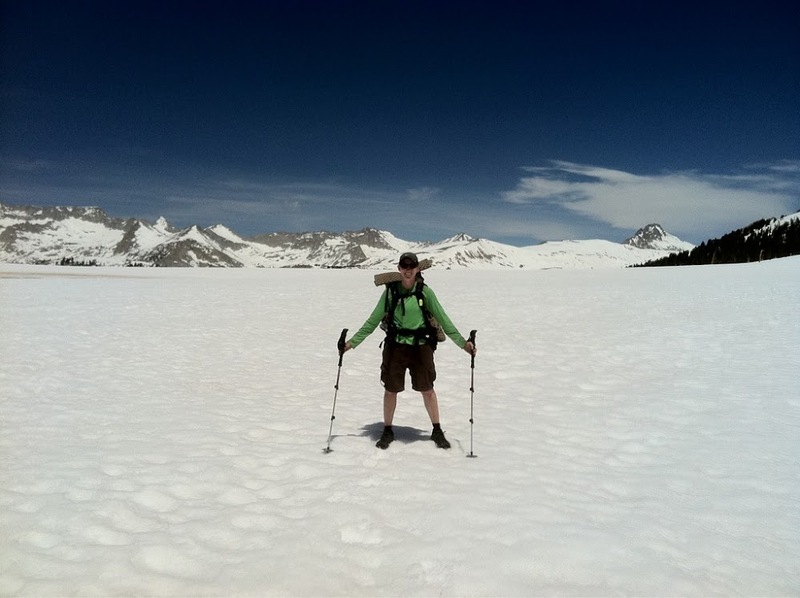 I am curious if you think snow shoes would have helped in the conditions you described above? Those that took snow shoes that’s year regretted it out there. The snow is compact enough from others walking on it most the time that you’re on more of a hardened slushy snow. Also, there are enough patches of rock and crossings that you’d be taking the snowshoes off and on a lot. There was less postholing and more just slipping and slowly getting footing. Not sure snowshoes would have helped much and most just laugh at people who tried that method and ended up lugging them on their backs.